Yes! You are totally on the right track. It's very heavy on growth and development, and the disorders it does have are almost all pediatric specific! Good luck!!! Which campus did you interview at?! I work at choa! Getting to that step is awesome. The wouldn't test you if they didn't like you. Just make sure u study!! It's not easy (obviously not impossible or crazy difficult, but it's very pediatric specific) good luck and congrats! I wish I would've realized that even after 3 years, some days I will feel like a terrible nurse, and others I will feel like a great nurse. As I say at work, 'some days you are the bug, some days you are the shoe'. It's so true every time I go to work! I guess I had this delusion that by the time I felt pretty comfortable with my job, I would feel like I was a good nurse most days. I'm just saying, keep your head up! There's good and bad days. CHOA Peds test.. what it's like! Dont be nervous! It's hard to tell somebody how to study for it, because it's basically pediatric NCLEX questions! Just know your pediatric specific disorders (not anything too crazy), and what is important to kiddos assessment wise. (Eating, peeing, pooping, respirations, cap refill... ect) Good luck! Post here what you think about it... to give other people some pointers in the furture! Dream job...no longer my dream job?? Surprised to see this post because I remember when you posted that you got the job, you were so happy! (I've been away from the site a while... the new job and starting school has been a handful for me lately!) Have you thought about trying to float to the NICU when you are able? Just to see what you think about it? I agree with the post that said that maybe if you get through that 6 month "hump", that maybe you will start enjoying it more because you'll get more confident. Just a thought. But either way, I'm sure you will make a good decision. You can't go wrong, they are both great opportunities! Electronic Stethescope. Yay? or Nay? A friend of mine has one and loves it. She can hear things I can't with a regular one. She has hearing problems and can't use a regular steth. But, she did get it swiped by family members when she layed it down to do a procedure in the ER and forgot about it for about 20 minutes. So if you do decide to get one, keep it close! It's way too expensive to replace every month. get ER wait times on your phone ? Well, theres not really a secret to it other than we work our butts off! Our docs have a ton of pressure to keep their "greet times" down, so they put the pressure on us to get workups done and people discharged/admitted. We also triage in the rooms so the provider can get in there quicker. So, most of the time, you walk in, get quickly checked in, then go back to a room immediately. If we ever get completely full in the back, we triage out front and work protocols to help make things flow faster when they get to the back. My grandmother had a stroke a few months ago, and even though she was mostly A&O, her language was so fowl for about a month afterwards during rehab! She had a foley in and did NOT like it, and would ask anybody who came in the room,"Are you going to take this out of my pu***?!" I worked in the hospital at the time and was just mortified at some of the things she would say, and she didn't understand why everybody would gasp. lol. Thankfully, everybody understood! I agree with the poster above. The fresher the better. I have even unhooked it and let it drain in a sterile cup before. However, I do disagree with your *gasp! * about learning from the patient. In the ER, people come with all sorts of things we aren't used to seeing or dont know the exact way the patient was told it should be done, so I have no problem asking,"when you do this at your home/doctors office/other hospital, ect, how do you do it?" I think I can use my judgement to see if it's along the correct lines. I had a patient who had an odd looking condom cath. Had some tape stuff that went around it. Me and two other nurses weren't exactly sure what was going on with it, so we asked. I learned something new. Better that than faking it! What position should I apply for?? I dont know that exact hospital, but I would think about what makes you want to work in L&D. Is it the relationship you form with your patient? Go med surg The babies, and possibly kiddos? Go ER Having mostly healthy patients till you get one thats seriously NOT? Go ER Getting really good at what you do every day? Go med surg I mean, they really overlap a lot, but not really so much with L&D. I will say, you are most likely to deliver a baby in ER than Med surg... :) But I think ER opens a lot of doors for you because it's some critical care experience. But only you can decide what the right area is for you, given your choices. Maybe somebody can provide insight into the specific units at that hospital that I do not have. Good luck to you! How did it go?!?! Met the educator for there today - super, super nice! 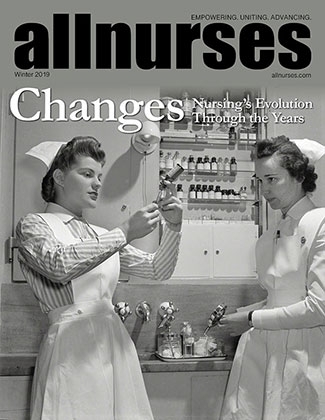 Your one stop for all the most popular pressing questions on allnurses! That thread has had almost 32,000 views!! That's a lot of views for those boobies! :) (I like when she says... "I couldn't pass the pencil test (even if there were a dozen pencils...)" HAHA. When is a patient your patient? We have implemented this system for the last year or so and actually works pretty well, unless the doc gets in there at the same time you do to triage (they push our docs on their patient greet times, so they are on your heels most of the time). We still have a single triage nurse till 11 or 12, then a 2nd triage added. Sometimes it's okay, sometimes you need more help, but I agree with the charge statement... days with a good charge go sooo much better with that rapid triage system.